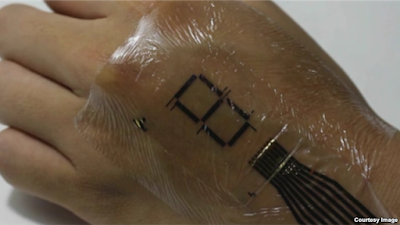 Japanese researchers are testing the electronic skin called e-skin, which later could be used to keep track of the biomedical data. In an article published in the journal Science Advances, a team of researchers from the University of Tokyo said that the layer of "ultra thin, ultra resilient" which are being developed by them will allow the functions such as blood oxygen levels and heart rate displayed electronically through light emitting diodes mounted on the e-skin. The thickness of e-skin was only two micrometers and consists of the layers of silicon oxynitride and parylene. According to the researchers, the special electrodes are inserted between the layers so as to enable them to include polymer light emitting diodes and organic photodetectors for the skin. The diodes are more thinner 10 times than the human hair was so efficient because not much need of electric power and generate less heat. "The advent of mobile phones has changed the way we communicate. While these communication tools are getting smaller and smaller, they are still discreet devices that we have to carry with us," said Takao Someya of the University of Tokyo's Graduate School of Engineering. "What would the world be like if we had displays that could adhere to our bodies and even show our emotions or level of stress or unease? In addition to not having to carry a device with us at all times, they might enhance the way we interact with those around us or add a whole new dimension to how we communicate. ".